Editor’s note: today’s caption is the answer to the March puzzler. Egypt’s Western Desert is dry, which is not surprising; it is, after all, a desert. But this part of the eastern Sahara (west of the Nile River) is so dry—receiving just centimeters of rainfall per year—that researchers describe it as “hyper-arid.” As such, it seems unlikely that much would grow there. Greenery, however, has been cropping up in the area in recent decades. 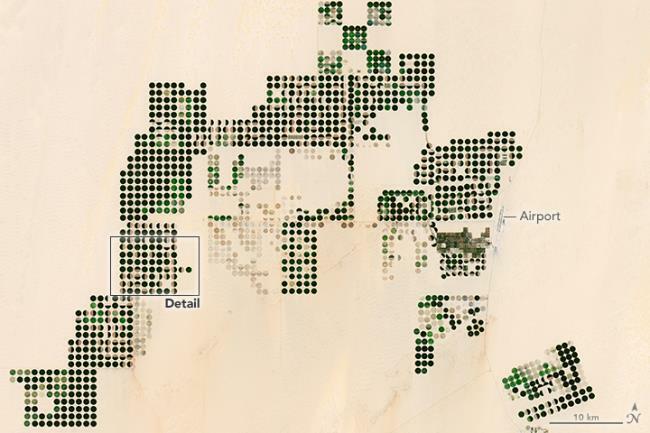 On February 26, 2017, the Operational Land Imager (OLI) on Landsat 8 captured these natural-color images of East Oweinat, one of Egypt’s land reclamation projects aimed at making some desert areas suitable for agriculture. 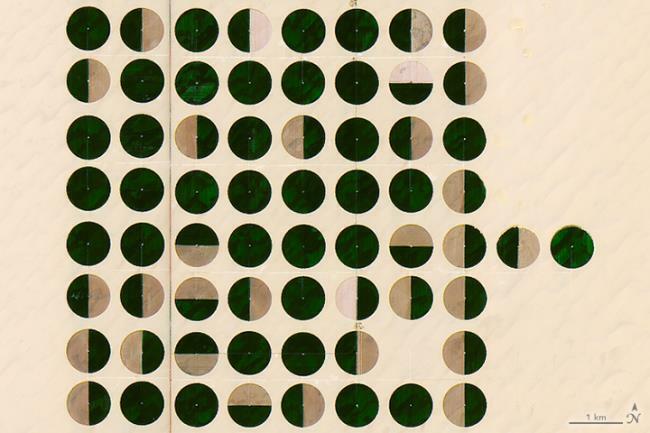 Both the wide and detailed images show the geometric forms of the cultivated land. The circles indicate the irrigation method: water pumped from underground is delivered to sprinklers that rotate around a central pivot point. The “fossil water” used on these fields comes from the Nubian Sandstone Aquifer, which recharges slowly and is considered a non-renewable resource. But for now, that water means plants can flourish in the driest of deserts. Agricultural development began here in the 1980s, and images from 1999 and 2001 show crops growing in parcels 1 and 2 in the southern part of East Oweinat. Research published in 2010 reported that the farming operation spanned almost 5,000 square kilometers (1,200,000 acres). According to a 2014 news report, companies were focused on growing wheat, an important food staple in the country. One company leasing land in East Oweinat reportedly produced 40,000 tons of wheat over the course of a year. Workers can move crops and equipment via the airport on the site’s eastern side. Digital Map of Egypt (2012, March 23) Map of East Oweinat. Accessed March 10, 2017. El Nary, A. H. et. al (2010) Soil and Groundwater Capability of East Oweinat Area, Western Desert, Egypt Using GIS Spatial Modeling Techniques. Nature and Science, 8 (8), 1-17. NASA Earth Observatory (2002, March 2) Irrigation in the Heart of the Sahara. Reuters (2014, December 5) UAE-Egypt alliance expands to desert wheat venture. Accessed March 10, 2017.